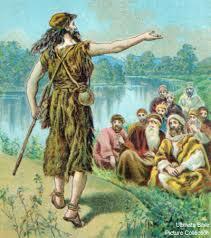 John the Baptist had a special role in God’s plan of salvation – the forerunner of the Messiah, challenging the people and leadership to repentance – not pointing to himself, but pointing others to Christ. John the Baptist spoke truth to power – which cost him his life. He asked for a tablet and wrote, “John is his name,” and all were amazed. The name John means “the Lord has shown favor”. The name Jesus means “the Lord saves”. John preached repentance, when accepted, led the people to be open to the salvation that Jesus Christ came to bring. How do we respond to God’s divine initiative in our life? Can we see the presence and action of God in every moment of life?